NEW YORK -- Disney’s South Pacific animated tale “Moana” fell short of a “Frozen”-sized debut but nevertheless dominated the Thanksgiving box office with an estimated $81.1 million over the five-day weekend. The well-reviewed “Moana,” about a princess’s mythical journey in ancient Polynesia, earned $55.5 million from Friday to Sunday in North America, according to studio estimates Sunday. Though it didn’t match the 2013 Thanksgiving release of “Frozen” ($93.6 million over five days in 2013), “Moana” (“MWAH-nah”) scored the second-highest Turkey Day debut ever. Boosted by the star power of Dwayne Johnson and the appeal of original songs from Lin-Manuel Miranda of “Hamilton,” “Moana” landed Disney another big hit in a year full of them. The studio has notched four of the top six films (“Finding Dory,” ‘’Captain America: Civil War,” “Zootopia,” “The Jungle Book”) and still has “Star Wars: Rogue One” coming in December. Falling to second was J.K. Rowling’s “Fantastic Beasts and Where to Find Them,” which earned $65.8 million over the five-day weekend and $45.1 million over the three-day weekend. The Harry Potter spinoff, from Warner Bros., has brought in $156.2 million in two weeks. Overseas, “Fantastic Beasts,” debuted in China, where its $41.1 million fueled a weekend haul of $132 million internationally. Those two blockbusters far outpaced more star-driven films. The Brad Pitt-Marion Cotillard World War II romance “Allied” opened with a mediocre $18 million over five days. The Paramount Pictures release, directed by Robert Zemeckis, cost a hefty $85 million to make. But for a proudly old-fashioned film built around the appeal of its stars, “Allied” had to largely do without Pitt’s promotional presence. The actor’s divorce proceedings from Angelina Jolie largely eclipsed the film, which drew an audience 85 percent over the age of 25. But Warren Beatty’s first film in 15 years, the 1950s Hollywood comedy “Rules Don’t Apply,” resolutely bombed with $2.2 million over the five-day weekend. Written and directed by Beatty, who also co-stars as Howard Hughes, “Rules Don’t Apply” is the 79-year-old star’s first directed feature since 1998’s “Bulworth.” Though Beatty has worked hard to push the movie (made for about $25 million), its slim total despite playing on 2,382 screens is one of the worst debuts of a wide release in recent years. “Bad Santa 2,” from Broad Green and Miramax, didn’t flop as badly as “Rules Don’t Apply,” but it pulled in a scant $9 million over five days. The sequel, again starring Billy Bob Thornton, comes 13 years after the 2003 original. In limited release, a number of potential awards contenders packed theaters. Debuting on a handful of screens were “Lion” ($32,092 per-screen average), with Dev Patel, and “Miss Sloane” ($21,000 per-screen average), with Jessica Chastain. Expanding from four to 48 screens was “Manchester by the Sea,” starring Casey Affleck. It took in $1.3 million with a per-screen average of $26,048. The holiday weekend was the sixth biggest Thanksgiving at the box office, according to comScore, falling slightly behind most recent years. But the fairly strong business, led by well-reviewed tent pole releases, continued what’s been a healthy fall season, up 4.5 percent from last year. 1. 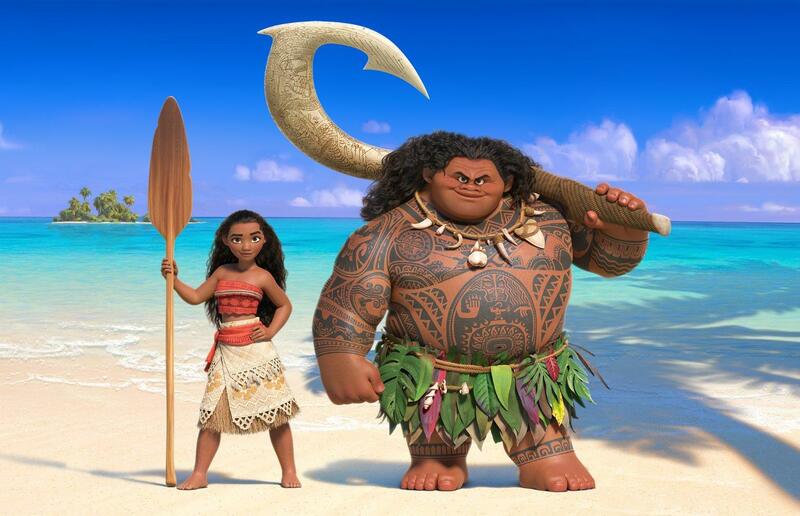 “Moana,” $55.5 million ($16.3 million international). 2. “Fantastic Beasts and Where to Find Them,” $45.1 million ($132 million international). 3. “Doctor Strange,” $13.4 million ($9.8 million international). 4. “Allied,” $13 million ($9.4 million international). 5. “Arrival,” $11.3 million ($6.7 million international). 6. “Trolls,” $10.4 million ($7.2 million international). 7. “Bad Santa 2,” $6.1 million ($1.4 million international). 8. “Almost Christmas,” $5.7 million. 9. “Hacksaw Ridge,” $5.5 million ($2.1 million international). 10. “The Edge of Seventeen,” $3 million. 1. “Fantastic Beasts and Where to Find Them,” $132 million. 3. “Doctor Strange,” $9.8 million. 7. “Jack Reacher: Never Go Back,” $6.1 million. 9. “I Am Not Madam Bovary,” $6 million. 10. “Sky on Fire,” $3.8 million.